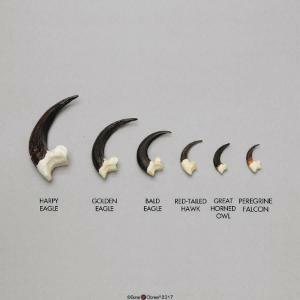 This set consists of talons from large birds of prey. From left to right: Harpy Eagle, Golden Eagle, Bald Eagle, Red-tailed Hawk, Great Horned Owl, Peregrine Falcon. Each Bone Clones® replica talon captures the subtle details of texture and color of the original. Please refer to the descriptions listed under the individual talons for further information.